Oudekki Loone neelas kaotuse väliselt üsna märkamatult alla ja õnnitles Aadu Musta võidu puhul. 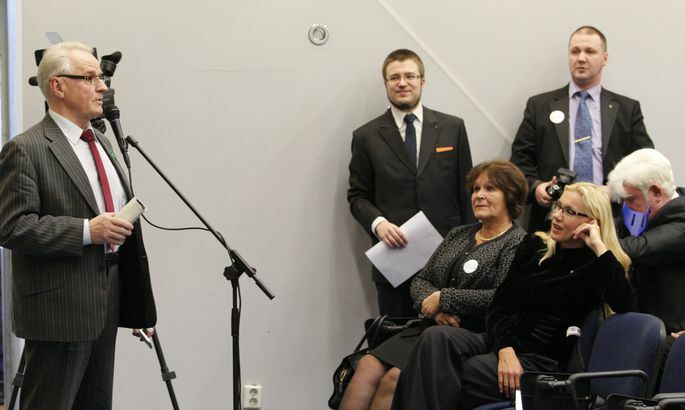 At Centre Party regional elections in Tartu this past Saturday, Riigikogu member Heimar Lenk repeatedly grabbed the microphone and demanded that he and others from Tallinn be granted the chance to greet those present. To no avail. Heimar Lenk (vasakul) võitles riigikogu liikmete Kersti Sarapuu ja Kadri Simsoni nina all õiguse eest enne piirkonnajuhi valimisi tartlasi tervitada, aga tagajärjetult. Keskerakonna Tartu piirkonna liikmeskond on valdavalt üsna eakas. In the Tartu University library conference hall, 173 Centre’s Tartu region members take their seat as people from the parliament Märt Sults, Kadri Simson, Jaanus Karilaid, Kersti Sarapuu and Heimar Lenk, plus the MEP Yana Toom fill front row. A glance at the hall reveals average age to be definitely above 60. A guy is wearing with forest worker overalls. Himself a Riigikogu member, Aadu Must kicks into gear by «greeting» people who have enrolled in the region to support his opponent. And underlines that personally he did not do anything like that. Quite a stir is created to make the trip from those from Tallinn worth the while. Moves are made to have favoured heavyweights to have an effect for the vote to come. The audience gets vocally involved. As contrasting approaches are aired contrasting agendas cited, Ms Toom the MEP up and takes the floor reminding those chairing the meeting about her position as vice chairman of the party. Mr Must admits to have gotten a letter – in the night. He apologises for having had other things on his mind in the lateness of the hour. He says speeches would surely come, forgetting to add that it’ll be after the voting for regional head. A man in the audience stands to his feet to claim these would not be greetings but propaganda. Mr Lenk thinks the audience would be pleased to hear greetings from those in Tallinn and from Riigikogu. As Kadri Simson is determined to hinder him from speaking, she gets publicly reprimanded. In the audience, the man who was vocal once before stands to underline that the agenda has already been voted for. And repeats the «propaganda» warning which greetings would turn out to be. In what follows, a tiny window opens for both candidates – Ms Loone and Mr Must – to be lavished a measure of praise. In whatever Camp Savisaar gets to say, the youth of Ms Loone gets stressed. Born respectively in 1979 and 1951, she’s 28 years younger that the latter. For some strange reason, the also young Ms Simson was earlier unable to unseat Edgar Savisaar, a man senior than Mr Must by a whole year. To this Mr Must basically retorts by irony over his opponent’s relatively brief career in the party. From the audience, he is scolded for talking down at the opponent. Mr Lenk comes up again to express surprise at the guests not allowed to greet a conference – a negative milestone. He is ignored. A lady asks to know what to do when she wants to vote against both candidates. Then vote not at all, she is answered. 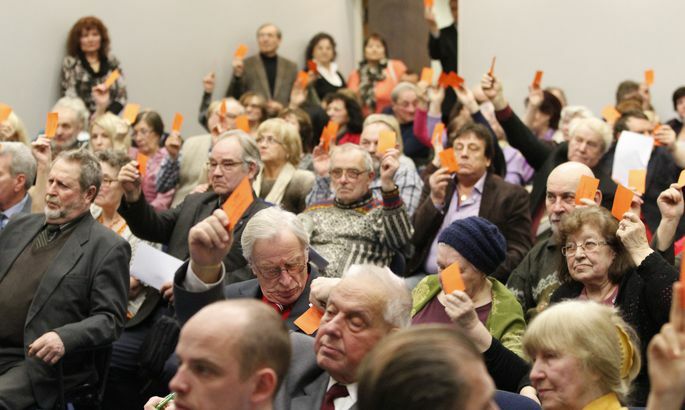 After the votes are cast, they are counted with unheard-of transparency – cameras are zoomed over the table and the Postimees photographer succeeds to grasp before the results are ever announced that Mr Must seems to have a thicker pack of votes. And he’s right. It’s 98 to 70 in Mr Must's favour. Just to be sure, they do count it again. The result stays the same. Mr Lenk is nowhere to be seen. Ms Toom soon takes her leave. They never got to greet the comrades in Tartu.